The Exhibit Center building was the result of several construction phases. The first was the "bubble building" noteworthy for being 120 degrees in the summer, frigid in the winter, and having the tendency to fall down frequently. In 1976, the building fell apart in a winter windstorm. In 1977, after public support through a letter-writing campaign by children, a permanent dome was lifted into place. The current exhibits in the main area of the center were completed in 1996, after a planning period of five years. The Discovery Room was renovated in 2014. Dinosaur State Park officially opened in 1968, two years after 2,000 dinosaur tracts were accidentally uncovered during excavation for a new state building. To provide visual information about the Jurassic period and the 500 tracks enclosed within the Exhibit Center's geodesic dome. a mural and diorama were created. 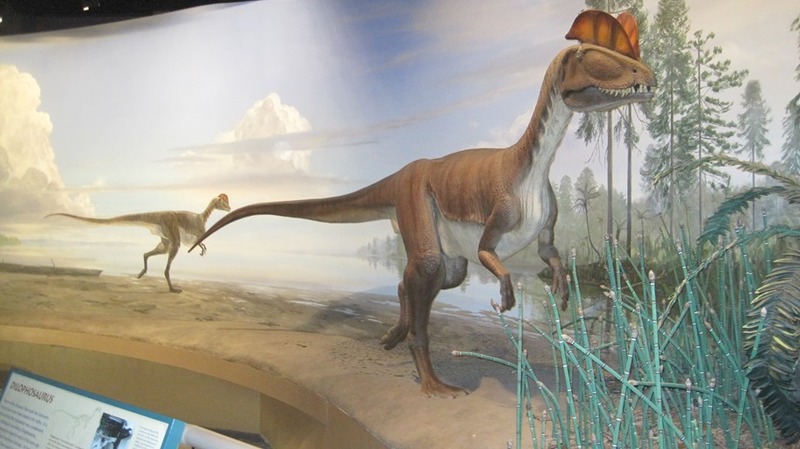 A model of Dilophosaurus, an 18 to 20-foot-long predator that is considered to be the likely source of the tracks named Eubrontes, is the highlight of the depiction of life during the Jurassic period. The mural depicts bare, exposed sand and mud flats covered with dinosaur tracks. Models of Anchisaurus, a small prosauropod, can be seen feeding on tree ferns, cycadeoids and young conifers. Dimorphodon, with a four-foot wingspan, can be seen gliding in the air. This pterosaur was neither a dinosaur nor a bird, but rather a carnivorous flying reptile. 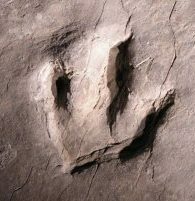 The exhibit area also includes a reconstruction of a geologic formation, highlights of the discovery of the tracks, fossils of other tracks, fish and skeletal reproductions of related dinosaurs. In 1990, the Friends of Dinosaur Park and Arboretum commissioned William Sillin, a noted landscape artist, to create a mural that would depict the Connecticut River Valley and its inhabitants during the late Triassic period (more than 200 million years ago). The climate at that time was semi-arid but subject to brief rain storms that carried sand, silt and mud onto the Valley floor. During the Late Triassic, reptiles and amphibians and crocodile-like phytosaurs were the primary predators. Within the foreground are life-size models, including Metoposaurus, Stegomus, Hypsognathus and Rutidon and the theropod dinosaur Coelophysis. 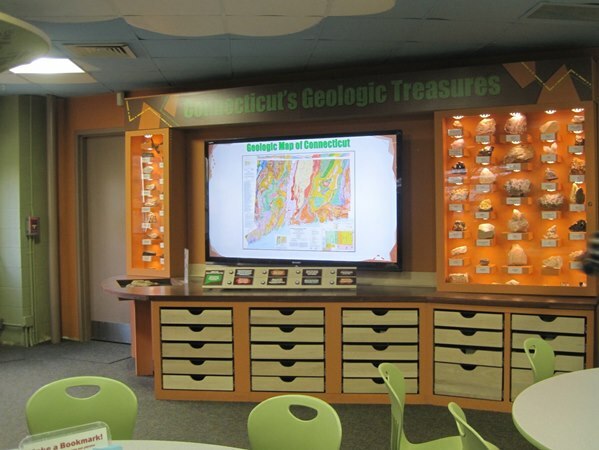 In 2014, the Discovery Room was renovated to include hands-on activities, displays of Connecticut rocks and minerals, and a large-screen interactive program covering the Connecticut River Valley. Exhibits have been designed for both adults and children and allow hundreds of specimens that have never been on display to be viewed by the public. Among the exhibits are “Connecticut’s Geologic Treasures,” which features an interactive geologic map of the state, pull and learn drawers containing dozens of specimens from Connecticut and an “Investigation Station” where visitors young and not-so-young can examine mica, crystal structures and more. The “Life Through Time Exhibit” showcases hundreds of fossil specimens from different time periods and different parts of the world. Other exhibits include a giant Mesozoic Magnetic Wall, a bird sounds station and a rock core display. The renovation of the Discovery Room is the result of many years of planning that included visits to other museums and surveys of park visitors. This project has greatly improved the visitor experience but we caution parents – your kids won’t ever want to leave! Dinosaur State Park added its newest interactive exhibit in early 2018 - a unique, customized dig pit, which contains a 5 foot by 5 foot reproduction of the trackway. The pit, located in the center of the main exhibit hall, provides young visitors with the opportunity to “discover” the tracks by brushing and digging through a layer of substrate. The three dimensional panel at the bottom of the pit was developed Dr. James Hyatt and his students at Eastern Connecticut State University using digital photogrammetry of the actual trackway.